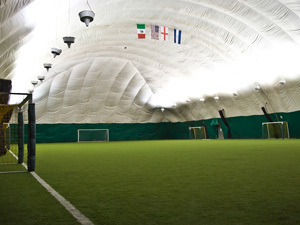 Armonk Indoor Sports Center is Westchester's premier indoor athletic facility, a 46,000-square-foot, state-of-the-art complex featuring two inflatable domes designed to accommodate field sports, tennis, and fitness programs for athletes of all ages and skill levels. Conveniently located in Armonk's Community Park, Armonk Indoor operates September to May, 6:00 a.m.-11:00 p.m., seven days a week. Our 22,000-square-foot turf field plays host to leagues, tournaments, team practices, classes, clinics, parties and corporate events. Field sports include soccer, lacrosse, football, golf, baseball and field hockey. In addition, the field can be rented out entirely or in sections. Armonk Indoor has four championship DecoTurf tennis courts (the same surface used at the National Tennis Center) with cutting-edge lighting and climate control. Our experienced professional staff offers an extensive selection of clinics and leagues to accommodate players from age three through adults. 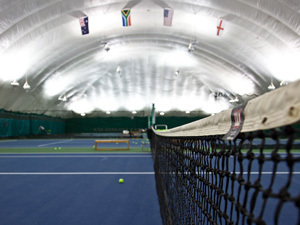 Armonk Indoor is also the home of Armonk International Tennis Academy.